White bleached flour is among the leading causes of obesity in the world, right after sugar and corn. This is because white flour contains nothing but simple carbohydrates, and simple carbohydrates can be very dangerous when eaten in large amounts. But how can we substitute something that has no apparent substitute? Using unprocessed brown/black flour for the pizza dough will not affect your blood-sugar the way white flour does (although it is just as caloric). 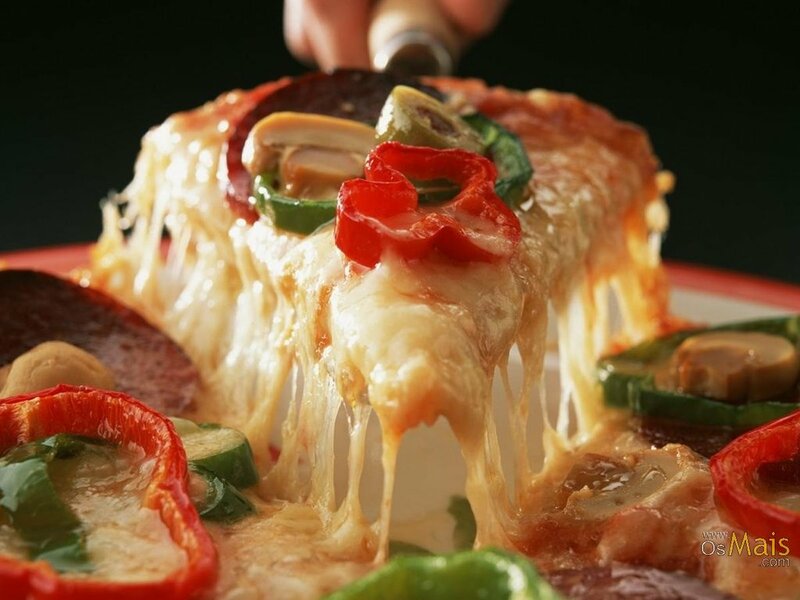 Some pizza makers like to knit mozzarella cheese into the dough. 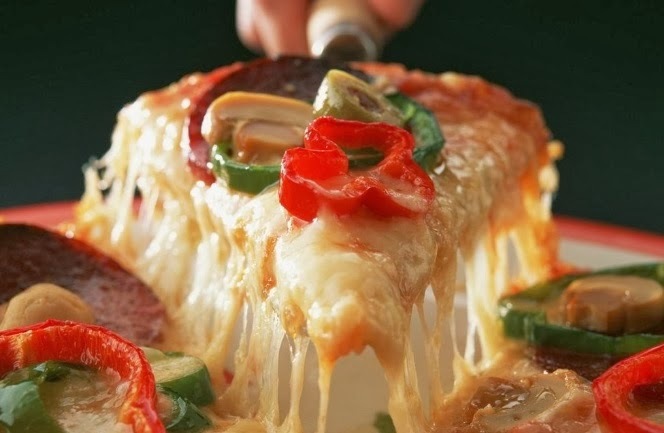 When you make your pizza dough make sure that it has no calorie-rich additives, like cheese, butter, milk etc. there is nothing wrong with tomato sauce, but only if you prepare it at home. Store bought tomato paste is jam-packed with sugar, preservatives, flavor enhancers and god knows what else. If you are going to by tomato paste, make sure it is organic and it doesn't contain sugar. Or you can just buy a pound of tomatoes make the sauce yourself. This is perhaps the most important factor when trying to make your pizza healthier. It is not true, that the more food you put on as toppings, the higher in calories the pizza becomes. Of course it is not about quantity, it is about quality. 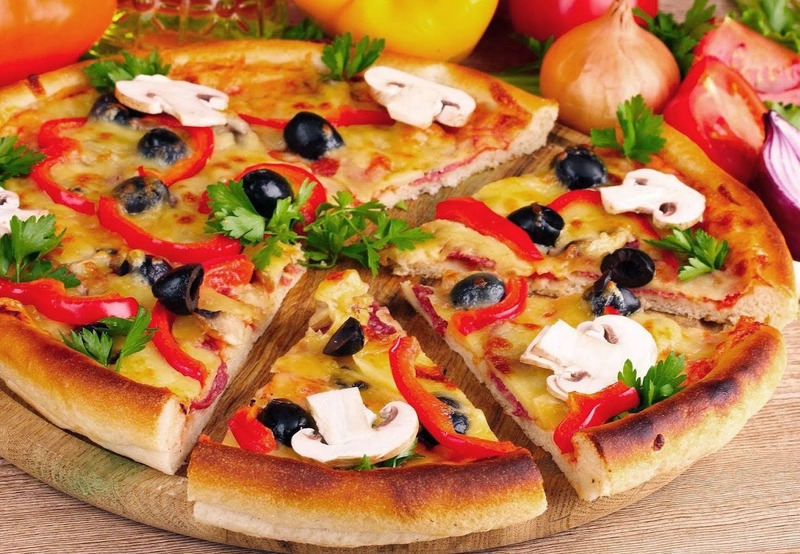 Even a pizza with one “bad” topping “like cheese pizza” can be 2, 3 or even 4 times as fattening as a pizza stuffed with fresh vegetables. When it comes to healthy greens, you can put as much of them as you want, without worrying about gaining weight or cholesterol. Personally I like mushrooms, so I make sure to put them on everything. But if mushrooms are not your things, you can use peppers; pickles; fresh tomatoes; onions etc. To give you a better example, let's look at the calories contained in peppers and the calories contained in pepperoni. Peppers have about 20 calories for 100 grams net weight, whereas pepperoni (or any other sodium-rich, high in fat deli product) has about 500 calories per 100 grams. Eating vegetables instead of cheese and meat will not give you any more in terms of vitamins and minerals (vitamins are very sensitive to high temperature), but they more than make up for it for not giving you high blood-pressure, cholesterol, cologne cancer etc. Even though cheese is high in fat, a pizza without cheese is like a house without a roof. You must have something on top to make yourself feel like you are eating an actual pizza. Not all cheeses are bad. Take cottage cheese for example. It is both tasty and low in fat. Just don't put too much of it though, for even low fat foods tend to harbor some hidden health risks. Please leave your comments below if you any thing to share. July Minor likes to spend her free time cooking. She is not a professional chef but has many interesting ideas and cooking styles to share with her readers. She currently works for http://www.bestcleanerslondon.co.uk/end-of-tenancy-cleaning-nw2-dollis-hill/.